I’m Doctor Sneha Sheth. I’m one of the board-certified family physicians here at Maryland Primary Care Physicians. Did you know that stress is a normal part of life? In fact, in certain situations, it can save your life. But, if stress becomes a constant companion, it can do serious harm to your health. Stress is the body’s reaction to a demand or threat. Your body releases stress hormones that increase your heart rate, tense your muscles, and get you ready for action. This is your “fight or flight” response. But when the stress becomes a constant state of being, it can cause real damage. It can lead to aches and pains, headaches, anxiety, depression, digestive issues, and even frequent illness due to a weakened immune system. Many aspects of life can lead to chronic stress: Financial worries, job issues, relationship trouble. Even positive things can cause stress – like retirement, buying a house, or planning a wedding. So, it’s important to identify and break the patterns of stress in our lives. It can take as little as 10 to 20 minutes a day to reset your body’s stress response. Meditation can help calm your body and your spirit. Exercise or a short walk outdoors can help the body to release endorphins, which trigger positive feelings in your body. Be sure to get enough sleep. Even pausing to take a few slow and deep breaths can make a difference. So, if you’re feeling that stress might be gaining the upper hand, talk to your doctor. We’ll work with you to help you break the patterns of stress in your life. Tackling stress could be key to you feeling better and staying healthy. 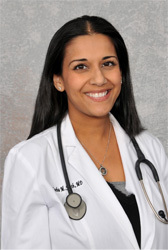 Dr. Sheth is certified by the American Board of Family Medicine. She cares for patients at MPCP’s Arundel Mills office.